The Gowanus Lounge: Group Suggests That PlaNYC 2030 "Misses the Boat"
Group Suggests That PlaNYC 2030 "Misses the Boat"
This city once had a great waterfront transportation network that moved freight, livestock, vehicles and people between all boroughs and New Jersey. Much of this was dismantled during the heyday of highway building because highways were seen as the new, better technology. Some forty years later, we find that our roads are clogged, our highways and bridges are constantly under repair for carrying excessive loads, and we never meet federal clean air standards. However, we hear little dialogue about moving things via the water that threads through our urban archipelago. 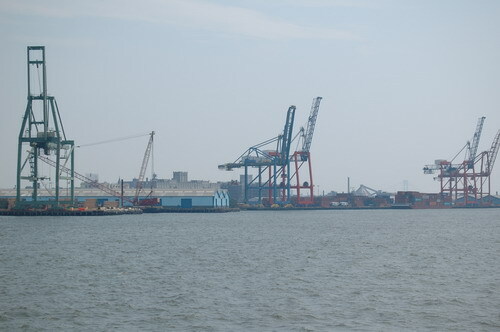 Private operators that make proposals to the city are often cold shouldered; New York waterfront planners forever show slides of waterside entertainments in Baltimore’s Inner Harbor (pioneering planning in the 80s) while neglecting to mention that Baltimore itself recognized that the pendulum can swing too far and instituted maritime protection zoning in 2004. PortSide believes it is high time to develop a new, innovative, varied and robust waterborne transportation plan. We also support clean water efforts, the reduction of CSO's, greater public access to the waterfront and more recreational boating...but given the momentum in those areas, we profoundly believe that THE key planning issue now is figuring out how to move stuff by water and incorporating that into the "new" waterfront. We need to find ways to SHARE these uses and users. 2) Don't race to rezone unused manufacturing zoned land. 3) To put goods closer to the final market, use and develop Brooklyn ports, a cross harbor freight rail tunnel, freight ferries and barges. 4) Develop ways to include new uses and public access without displacing the vessels that deliver sand, stone, cement, lumber, asphalt, etc. and distribute fuel for homes, vehicles and power plants. 5) Develop new forms of waterborne transportation with new vehicles and new routes.There is more to the proposal than we can possibly do justice to here, so we suggest heading over to PortSide's web page to learn more. For now, all we will add is that there is a school of thought that global energy supplies may start to shrink sooner rather than later and that, as they do, there will be intense pressure to re-industrialize the waterfront, starting with transportation.